What is representative of the "New Jersey hot dog"? 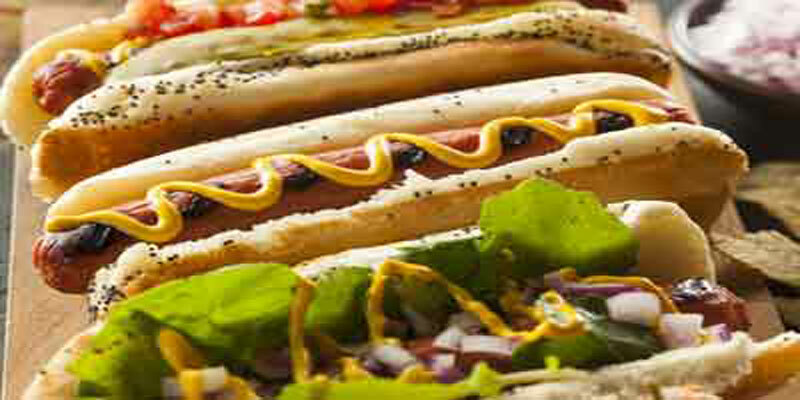 While there are many claims such as Germany, Chicago, and Connecticut as to where the hot dog capital of the world is, there is strong evidence that New Jersey can claim it is the "hot dog capital of the world". 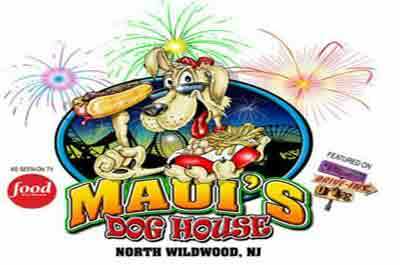 If not all of New Jersey, than certainly northeast New Jersey which has claim to the origin of several popular versions of the hot dog and home to some of the top hot dog manufactures in the country. With all the hoopla about New Jersey hot dogs, it should be noted that south of the Raritan River in Central and South Jersey, there is a significant drop in the quality and popularity of hot dogs. This may also be a strong argument for northeast Jersey being the "hot dog capital of the world". While the hot dog (frankfurter) was created in Germany, North Jersey has a long history of creating three of the most popular types of hot dogs consumed in the world --- the "Hot Texas Weiner", the "Italian Hot Dog", and the "Ripper". With the popularity of these hot dogs and other hot dog versions, New Jersey can make a legitimate claim to being the current hot dog capital 0f the world. Despite the opinions expressed by Texans, there is a strong school of thought that claims the "Hot Texas Weiner" -- a chili dog -- was created and made famous in Paterson, NJ. This began in 1924 when a hot dog stand was opened and run by a Greek man in downtown Paterson. 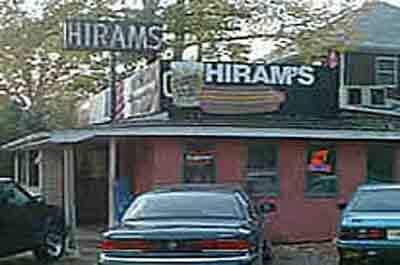 The name of the hot stand still remains a mystery. However, in 1936 a former employee of this Greek hot dog stand left and opened Pappas Lunch, later called Libby's Hot Grill, and has since become Libby's Lunch which is still in operation under different ownership. Since it's beginning, a number of former employees of Libby's left to open other Hot Dog stands in Paterson. 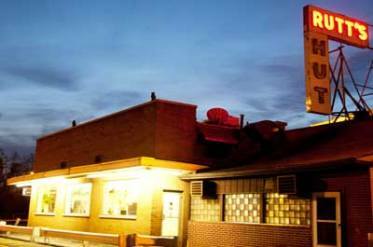 One of them, the Falls View Grill opened in 1949 and carved out a reputation for serving an excellent Texas Weiner. The "original" Falls View Grill closed sometime in the eighties. 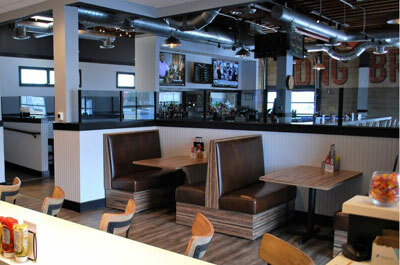 Former employees of The Falls View Grill have also moved on to open their own "Hot Dog Stands" including The Colonial Grill on Chamberlain Avenue in Paterson, and the Hot Grill on Lexington Avenue in nearby Clifton. The Italian Hot Dog was created by Jimmy Buff's more than 75 years ago in Newark and continues to remain a North Jersey favorite. Some claim it's the water in North Jersey, others claim that there just hasn't been any Italian Hot Dog restaurant former employees that have ventured south of the Raritan River. The Italian Hot Dog is made from large loaves of pizza bread, cut into quarters, sliced down the middle, and stuffed with one or two deep fried hot dogs, topped with onions, peppers, and deep fried potatoes. The soft pizza bread is a perfect vehicle for the ingredients, holding everything together and soaking up some of the grease. If you're not from North Jersey, don't make the cardinal sin of adding ketchup to the Italian hot dog -- it destroys the true flavor of the Italian hot dog. Ketchup contains sugar and other ingredients that overwhelms the flavor of the hot dog. The ripper was created in Clifton, NJ in 1928 by Royal Rutt, of Rutt's Hutt. The ripper is a pork and beef hot dog that's deep-fried in fat at a temperature of 310 degrees --- until it splits apart. Largest Manufacturers of Hot Dogs. 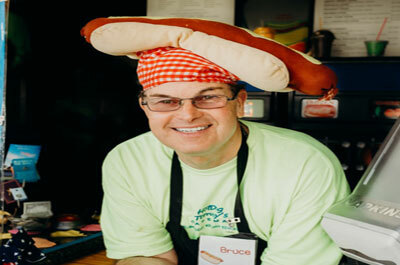 Best's Hot Dogs made by Best Provisions in Newark, is one of the country's top manufacturers of hot dogs. 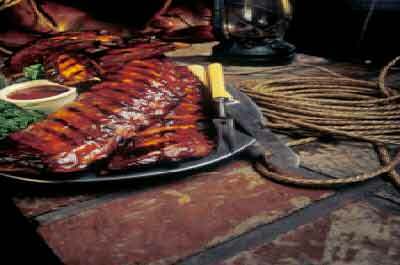 They are gluten free beef franks made with natural spices that are blended, linked, and naturally smoked. Sabrett Hot Dogs, known for their all beef natural casing and skinless hot dogs are manufactured in New Jersey. Sabrett hot dogs are often referred to as "dirty water dogs" because they are cooked in hot water. 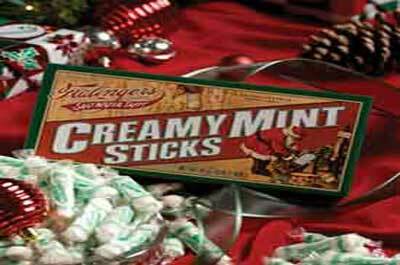 Thumann's Hot Dogs are manufactured in Carlstadt, NJ and makes natural casing pork and beef franks. A New Jersey legend with a storied history. 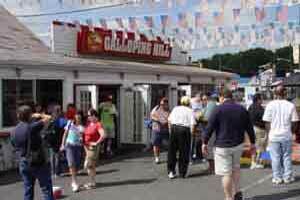 If you grew up or lived in Bergen County, when you think of hot dogs, Callahan's probably would be your first thought. Their signature burger is the Stuffed Truffle Mac & Cheese Burger made with white truffle oil, bacon, smoked gouda mac n' cheese, and two burger patties which are then pressed, stuffed, breaded, and fried. 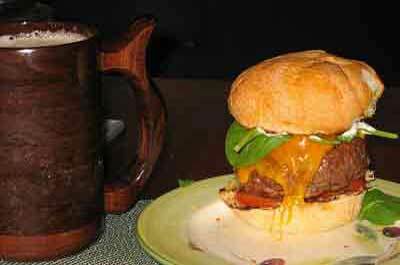 with a side of gouda man'n cheese! 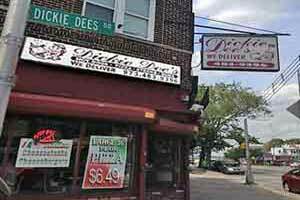 In the city where the Italian Hot dog was created, Dickie Dee's is the only authentic Italian Hot Dog place left in Newark. They differ in the style of the Italian hot dog with the size of the potatoes cut in larger chunks. 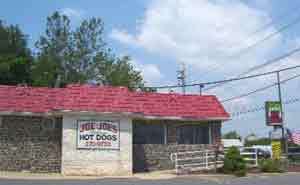 Opened in the 20's, they serve a grilled specialty dog with an oversized roll filled with a generous amount of onions, chili, and a tasty homemade relish. Their hot dogs are natural casing custom made by Grote & Weigel in Connecticut. They serve a deep fat fried, a pork beef blend, Texas wiener chili dog with a toasted bun. The onions have a bite and their chili sauce has a spicy kick to it. 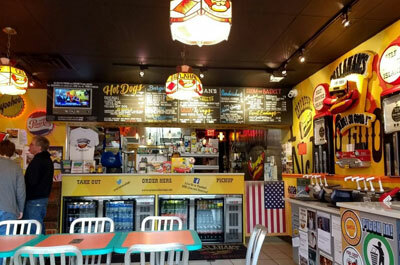 This hot dog venue has a historic background having evolved from past generations of former employees of the creator of the "Hot" Texas Weiner -- Chili dog. They serve up a deep fried dog covered with chili sauce, onions, and mustard. They serve up a unique version of the "Dirty Water" hot dog, Their hot dog is boiled and then topped off on a grill for extra crunchiness. The New Jersey Italian Hot Dog was created in their original Newark location more than 75 years ago when Jimmy Buff's owner James Racioppi created the Italian Hot Dog. 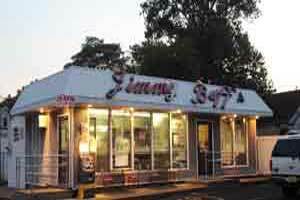 The original Jimmy Buff's no longer exists today. 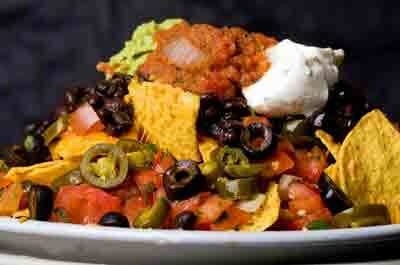 The two locations are owned by Jim Raccioppi the grandson of the founder of Jimmy Buffs. 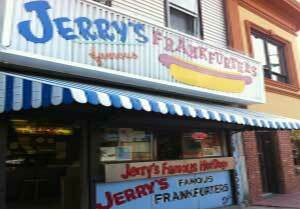 These locations run by Jim Raccioppi are claimed to be the true recipe of the original Italian Hot Dog. The pizza bread comes from a local bakery and their Italian hot dogs are filled with potatoes, hot dogs, peppers, and onions with both the potatoes and hot dogs cook in soybean oil. Rutt's Hut is a land mark hot bdog stand. Famous for it's "Ripper" Hot dog, an ugly looking pork and beef hot dog that's deep-fried in fat until it splits apart. 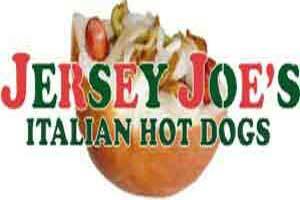 Located across the road from Sandy Hook Bay, they serve the best "Italian hot dogs" in Central Jersey. 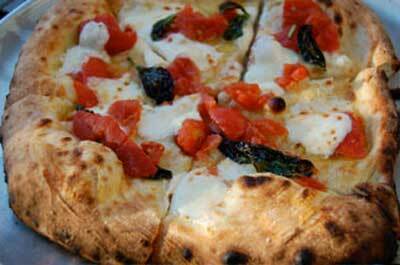 Enjoy it wth potatoes, onions and green peppers, on a wedge of pizza bread. Opened in 1928 and dating back to when it was located on the Long Branch Boardwalk, Max's has become known as a Jersey shore landmark for hot dogs. Max's serves a good quarter pound Schickhaus hot dog. Though very popular in South Jersey, North Jerseyans would shun his method of cooking hot dogs by steaming them and placing them on a roller grill. 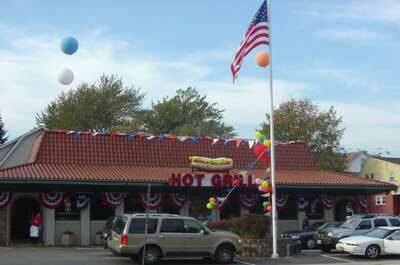 They serve a large variety of hot dogs with the chili-cheese dog being the most popular. There is a sign reading "Sorry, we do not have red onions or cooked onions. Dat's North Jersey. So don't ask for them. We serve raw diced onions." They use a premium grade hot dog that is slightly milder than an all beef dog. Here you can get over 29 varieties of toppings including Chili (North Jersey Texas Weiner style), sauerkraut cooked in beer, and more.